Den klasiske "rock" blinder. Benyttes bl.a. til scenebrug, hvor publikum blændes et kort øjeblik. The Stage Blinder 8 DMX is an active version of the already popular Stage Blinder 8. 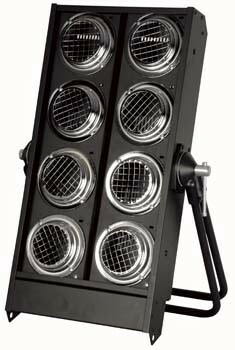 It has a built-in 4 channel dimmer so that the Stage Blinder can be controlled and dimmed by DMX with groups of 2 bulbs. Please note that because of the high power consumption of 8 x PAR 36 DWE this unit has 2 power inputs to split the power.